This article first appeared in BlogHer. Yesterday’s news of the death of Paolo Soleri — the visionary architect, builder, artist, writer and theorist — put me in mind of our family visit last month to Arcosanti, Soleri’s urban experiment in the desert of Arizona. 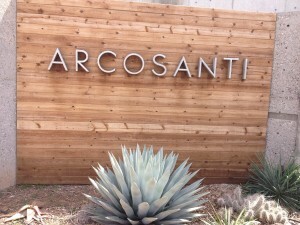 Before our trip to Arizona, we had shown this TED talk about Arcosanti to our teen, who has more than a passing interest in architecture and design. The video opened his eyes to the importance of “arcology” (architecture and ecology – two key parts to a single, whole structure). Soleri insisted that sustainable cities can support large populations if they are congruent with the environment, take advantage of technology and sustain meaning-giving culture. It’s a bit of a leap, though, for a young digitally-minded person to appreciate the on-the-ground reality. Arcosanti, which has been largely built on the proceeds of sales from wind bells made on the site, appears to be in the preliminary stages of implementing its grand vision. The main concepts are there including a ceramic studio/ performance space designed as a semi-sphere facing south — shading itself in the summer and gathering light and heat in the winter; and two story apartments built for both work and living (what would Yahoo’s Marissa Mayer have to say about that and her no-working-from-home policy?). But the complex, begun in 1970, operates less than 10% off the grid and houses 60 residents (the plan is for 5,000). Still, vision is vision, and the best test of visionary ideas lies in their implementation. And to get a taste of arcology historically, we continued a short distance north on Interstate 17 to Montezuma Castle National Monument. Montezuma Castle is a 600-year-old dwelling built into a rock cliff 100 feet above a river valley. The Southern Sinagua, a prehistoric culture, flourished there in a 6-story apartment-like building of about 45 rooms and terraces. Like Arcosanti, the Castle was built in such a way as to take advantage of/ be protected from the elements, and the river valley was an ideal location for gardening and fishing. Like the residents of Arcosanti, the Sinagua were fine artisans known for their crafts. In harmony with their environment and culture, the Southern Sinagua pueblos thrived for 400 hundred years. To really put concepts of “design,” “sustainability” and “culture” into perspective, no trip to the area is complete without a visit to Las Vegas. Paolo Soleri had a vision for our evolutionary journey away from hyper consumption and towards a state of “leanness.” I don’t know what he had to say specifically about Vegas. But I can only imagine. wow, the Montezuma Castle is amazing, what a cool living spot that must have been for the Sinagua! Thanks for posting this, Barb. I’ve never been to Arcosanti but my friend and ecocity pioneer Richard Register talks Paolo and Arcosanti all the time. I think trying to build a new settlement from scratch far off the beaten path is really challenging, no matter how visionary or well designed it is. Ultimately any settlement comes down to its culture, and it takes a long time to establish cultural roots that draw in people and give them a sense of place and history. Of course, it’s much harder to do any kind of visionary experimental design and architecture in an already established and culturally rooted place, so it’s a bit of a Catch 22. I do hope that Paolo’s vision will endure and that Arcosanti can continue to evolve so that at least it will continue to be a place that people come to visit to get inspired and think about what’s possible. 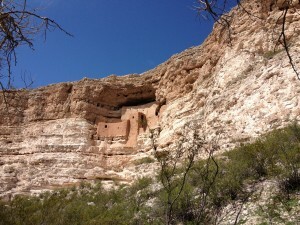 And – yes – Montezuma Castle is well worth the visit alone! I hope you get there some time in the near future!